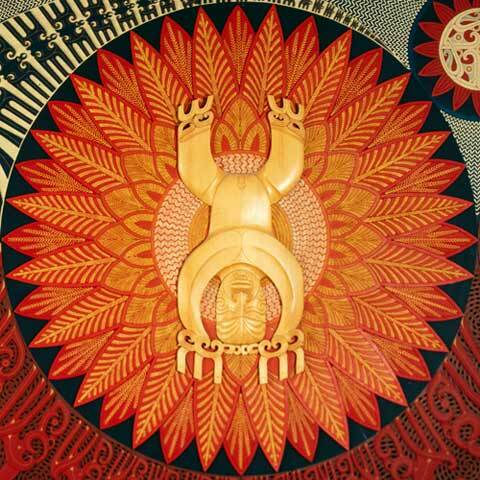 This carving of the god Tāne is part of a larger work by Cliff Whiting, called ‘Te wehenga o Rangi rāua ko Papa’. Tāne is shown separating his parents, Ranginui and Papatūānuku, by standing on his head and pushing up with his feet. He then used posts to hold up the sky. Permission of the National Library Gallery, National Library of New Zealand, Te Puna Mātauranga o Aotearoa, must be obtained before any re-use of this image.